Amanda Vela is the Denver-based artist behind Spirit Pervades Matter, a collection of whimsical, bohemian, zen-ornamental imaginings that celebrate the unconscious, elements of reality below the surface, God, a transcendental reality or simply - the "spirit that pervades matter". Amanda illustrates or paints all her images by hand, using predominately color pencil, watercolor, archival ink, and oil paint. 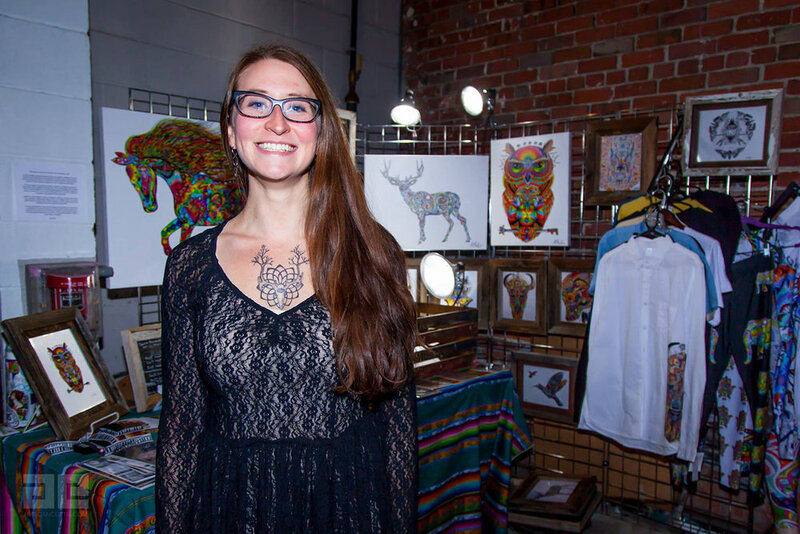 An active member of the Denver art community, Amanda maintains a focus on sustainability by using locally, handmade reclaimed wood to display her work, among other environmentally-friendly practices, and also has her Wearable Art apparel printed here in Mile High. At Summer Flea, Amanda will be offering a limited edition run of 9x12 inch prints on watercolor paper for several brand new original artworks. We're also excited to share that Spirit Pervades Matter and Art of Cody Kuehl recently opened a gallery called Red Wolf Gallery with some of their fellow local artists and friends at the Booz Hall RiNo space. Be sure to check out the space on your next visit to the RiNo 'hood! Spirit Pervades Matter isn’t a brand, it is a lifestyle, a spiritual practice; it is a series of drawings, paintings, and the in between, images I create during meditation. They are prayers, and offerings of my gift as an artist back to my Creator, expressions of worship and connection, and the product of a visceral calling to share the peace, joy, and freedom I have found in this relationship with a power greater than myself. Spirit Pervades Matter means an opportunity for me to provide an uplifting moment for someone else. The first piece I created and reproduced to make prints and sell as Spirit Pervades Matter was my elephant drawing entitled Overcoming Obstacles; it was about grounding, growth, new beginnings, and the beauty that lies beneath the surface of all things, and inspired the psychedelic animal series you see today. I create pieces of art in hopes that people will be uplifted by them, that for a moment they can be transported by the vibrant color, harmony, and flow of abstract geometry out of the stresses of everyday life and into joy and freedom. My process is stream-of-conscious drawing that has evolved from highly intricate free-hand pen and colored pencil mandalas to zentangle wildlife designs with hidden images and other subjects that tell a metaphysical story using pencil, paint, and mixed media. Art is a large part of what I am led to give to the world, as an expression of the hope, harmony,, and overwhelming joy, my desire is that my work, Spirit Pervades Matter, will uplift those who see it, and that this peace and joy I have found which inspires my work will transcend beyond the canvas, and into hearts of people who see it. The best part of my day is when people share with me that they experienced that moment of joy and felt happiness in viewing my work. I work mostly with archival ink pens, india ink, colored pencil, and watercolor, reclaimed wood, and recycled paper and canvas. Recently I have been adding acrylic and oil paint pieces to my collection, as well as experimenting with resin, alcohol ink, and mixed media. what's the best part about being a colorado maker? The loads of inspiration all around us in the natural beauty of our amazing state!! 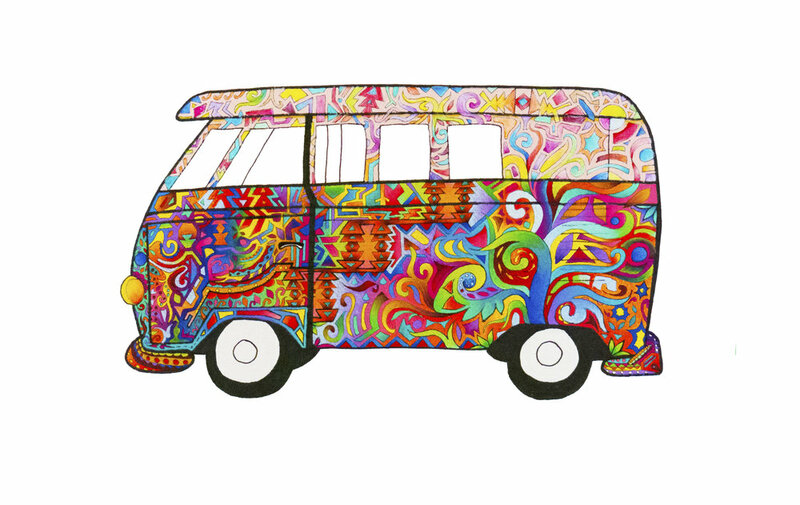 Amanda's "Wanderer: Spirit of Freedom" print, to inspire adventures all Summer long! A portion of the proceeds from the sales of my art go to my favorite charity Compassion International. You can always find my original art exhibited at Kanon Collective in the Art District on Santa Fe and me there on most First Fridays. All my line work is done free-hand with pens or brushes.